Containing a compound known as capsaicin, cayenne peppers have been found to aid in weight loss, lower blood pressure, and reduce inflammation, all while giving your food a spicy kick. So, what’s the evidence of cayenne pepper benefits? Read on. 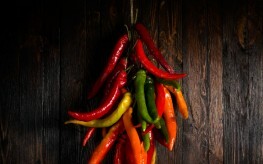 As mentioned, the compound credited with the health benefits of cayenne peppers is known as capsaicin. It’s also the compound that makes the peppers so spicy. Capsaicin has been found to reduce inflammation, which can aid in the treatment of arthritis and even the prevention of serious conditions like heart disease and cancer. But the capsaicin benefits don’t stop there. 1. Easing Pain – According to Dr. Daniel Zagst, capsaicin triggers the release of something known as Substance P, which notifies the brain that you’ve encountered pain, namely the burn of the spicy pepper. He says this depletion of Substance P can work to reduce the pain you experience from other conditions, including injuries and arthritis. 3. Weight Loss – Several studies have shed light on the capsaicin and weight loss connection, with the substance aiding in weight loss. It is suggested that the pepper helps increase thermogenesis, or the rate at which we burn fat for calories, and even decreases appetite. Researchers from Purdue University found that dieters who sprinkled their food with cayenne pepper burned more calories and were better able to manage their appetite than those who did not. The findings were especially pronounced in those people who didn’t normally eat spicy foods. 4. Improved Circulation – Because cayenne is able to increase circulation, it has significant value in herbal treatments that depend on fast application. In other words, it can speed blood flow and healing nutrients to the tissues that need it the most. It could even be used as a natural angina treatment because it is a natural vasodilator (dilating the blood vessels). 5. Anti-Cancer – Finally, there is evidence that capsaicin could be used in the battle against cancer. One study, published in Human & Experimental Toxicology noted the ability of capsaicin to target the mitochondria of cancerous cells, triggering apoptosis or cell death. The benefits of cayenne peppers are many. But even if you don’t like spicy foods, you can get some capsaicin from milder peppers. It’s most concentrated in hotter varieties though, so eat them as hot as you can stand for the best health benefits.